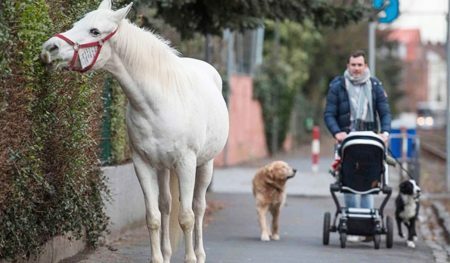 Although it is well into the spring season, someone hasn’t told Mother Nature. Fox News reports that a massive “late-season winter storm” is set to hit the Central United States and Upper Midwest by midweek. Classified as a “bomb cyclone,” this storm is projected to dump heavy snow, followed by more river flooding. A bomb cyclone is a storm that rapidly intensifies and drops 24 millibars – or atmospheric pressure – in a 24-hour span. The Central US experienced a bomb cyclone just three weeks ago, which resulted in massive flooding. Now, the same areas are in danger again. The National Weather Service’s Weather Prediction Center says the storm is likely to cause “life-threatening” travel conditions in the area beginning on Wednesday (April 10), which include power outages. Wednesday will also bring heavy snow over parts of the Northern and Central Plains. The late winter storm is currently in the Pacific Northwest and will develop in the Northern Rockies overnight. Heavy snow, blizzards, and hurricane-strength wind gusts are to be expected in the Central Plains, Upper Mississippi Valley, and parts of the Upper Great Lakes by Thursday (April 11). AccuWeather is reporting that 200 million people are in the path of the storm. 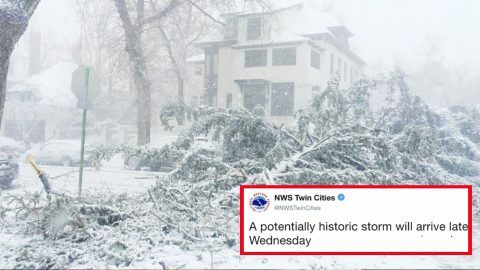 The National Weather Service in Twin Cities, Minnesota tweeted that the massive storm could be “potentially historic.” They predict the storm will bring different kinds of precipitation, gusts of wind upwards to 50 MPH, and heavy snow. They are warning residents to prepare for a severe storm. Blizzard Warnings have been issued from Nebraska to western Minnesota. CBS News reports the storm will last at least 48 hours, and up to 60 hours. Heaviest snow will be in Nebraska, South Dakota, and southwestern Minnesota. Some places are predicted to receive up to 36 inches of snow. If you live in this area or know anyone who does, please stay safe!